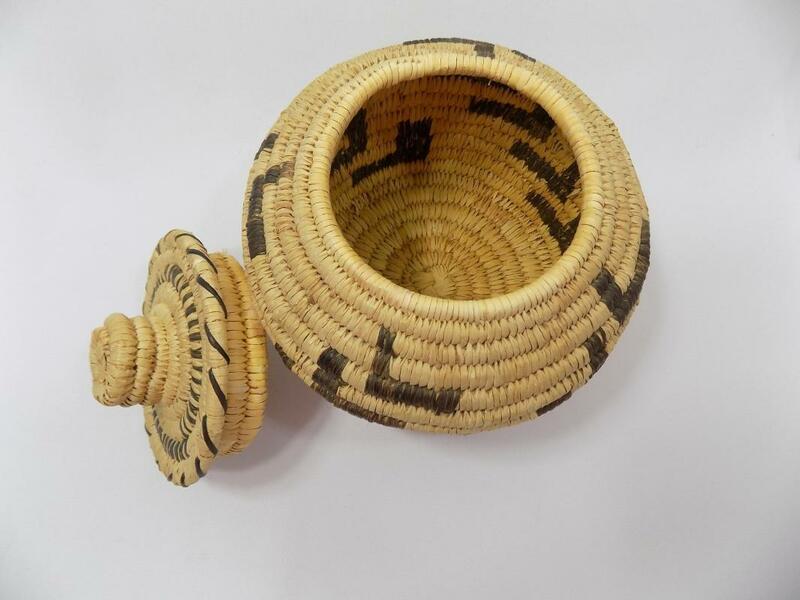 This coiled basketry jar was made by a member of the Tohono O'odham nation named Sally Juan. Thanks to an accompanying information card, we have the rare pleasure of knowing the maker of this beautiful lidded basket. 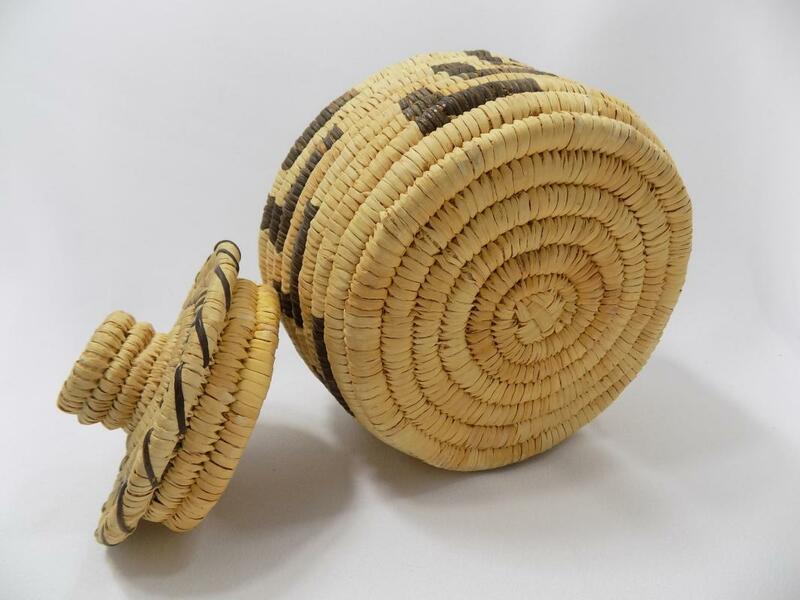 The foundation of this piece is composed of coils of bear grass, with approximately three coils per inch, which are stitched together using strips of the stiff, pointed leaves of the yucca plant. The stitch count is nine per inch, nice and tight. 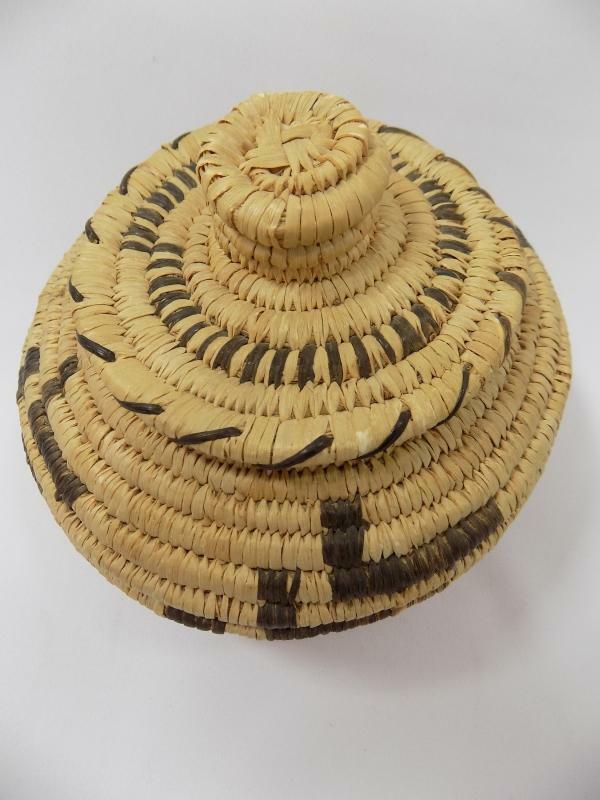 The stepped, geometric designs on the basket and the designs on the lid were made using pods from the cat claw plant (also called Devil's claw). 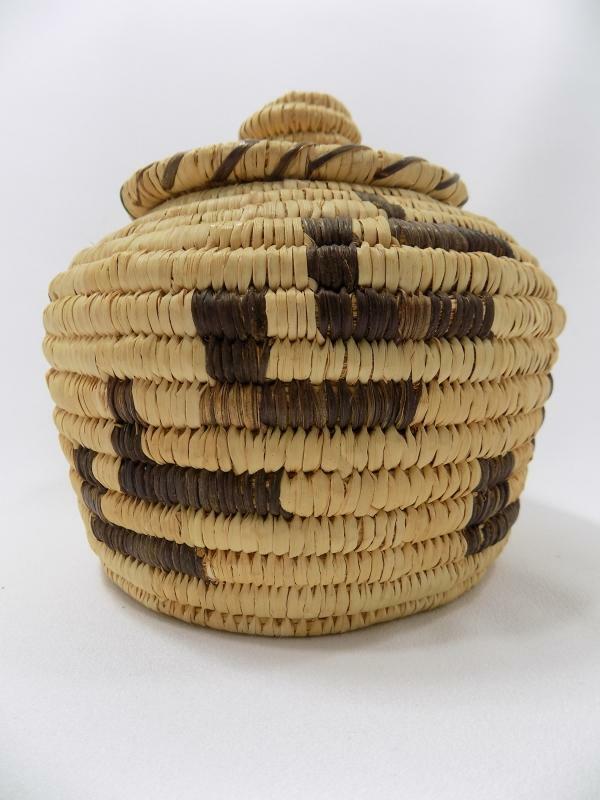 In the 1930's, when the willow the Tohono O’odham women previously used for basket making became scarce on the Reservation, they turned to yucca and bear grass. 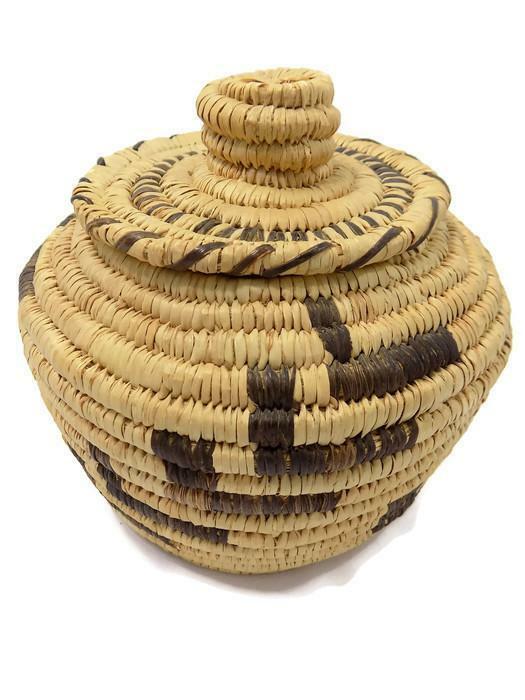 Tohono O'odham (the name means "Desert People") baskets are handmade with the native plants of the Sonoran Desert in southern Arizona, without any dyes, just the natural colors of the plant materials. 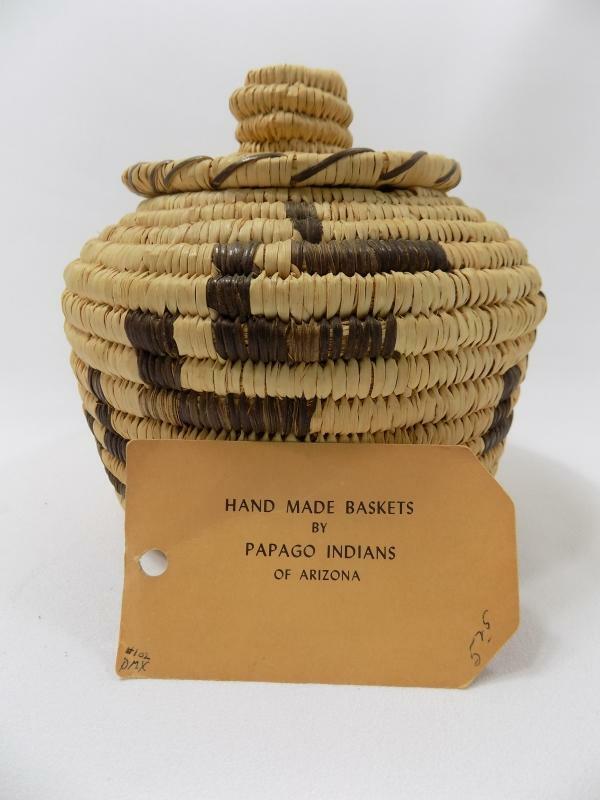 Some of this information is on the Papago Trading Post card found inside the basket, along with a tag that we don't think belongs with this basket. We'll include both when we ship the basket. 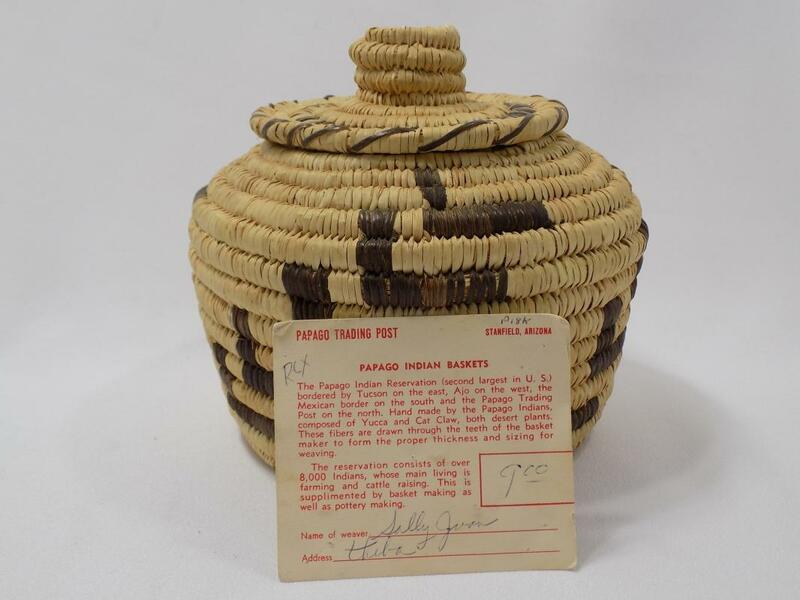 The Papago Trading Post in Stanfield, Arizona, known for selling exquisite Papago baskets, closed long ago; although both of these cards are undated, we believe the basket was made in the 1960's. Notice the price --- $9.00! The basket stands 5 inches tall without the lid, 7 inches to the top of the coiled knob when the lid is on. At the widest point across the shoulder it measures 7 inches, its base is 5 1/2 inches in diameter and it weighs just under a pound. It's in excellent condition, with no breaks, missing pieces or stitch losses. The lid fits snugly and securely and the basket sits evenly on flat surfaces. The variation of the color of the designs comes from the use of natural, undyed fibers. 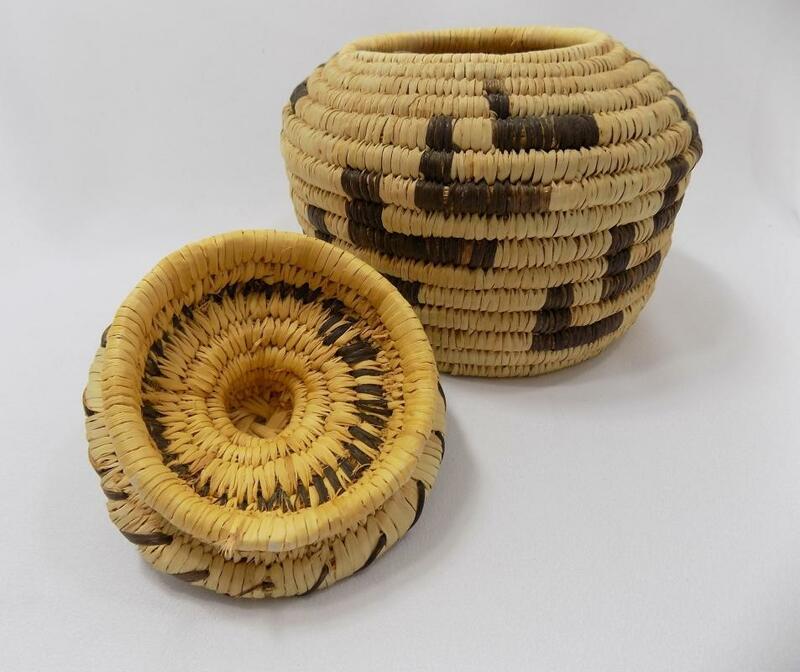 Tohono O'odham basket makers are some of the finest among native Americans. This basket by Sally Juan bears out that assessment. It's an excellent find to add to a collection or use for decoration. *** The Tohono O'odham tribe prefers that name over the previously-used Papago. Their designs are sometimes named, but not from ancient usage. The names were often coined by sellers to please their curious customers.--in fact, some of the designs were suggested by the buyers.